Nothing adds exotic style and finesse to a room like an Oriental rug. It doesn’t matter how up-to-date your furniture; the power of this rug can detract from fraying edges and a scuffed chest of drawers. The rug is all you’ll need. The origins of carpet weaving are difficult to pin-point, as carpets are prone to general deterioration over the centuries; worn out through use and destruction by rodents and insects. The earliest carpet fragments have been found at different points across the globe and would have been used simply to protect the home (even the temporary kind) from the cold and damp. Complex designs, silks and the sense of luxury were to come later. Because of its quality, Persia’s Pazyryk carpet is considered to be the oldest knotted carpet in the world, dating to around 500 B.C. It was discovered in the Altai Mountains of Siberia in 1949 and records show that during the Achaemenid period, the court of Cyrus the Great (and his tomb) at Pasargade was decorated with these ‘magnificent carpets’. The Pazyryk carpet has an advanced weaving technique that suggests a long history of evolution and experience and unusually its origins do not appear to be nomadic – rather it seems to have been made in a production centre. 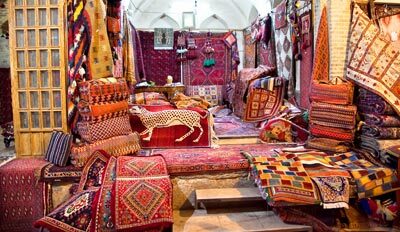 By the 6th century, woollen and silk Persian carpets were a favourite of courts in the Middle East. They remain a sign of wealth and opulence across the world – frequently found in mansions, palaces and museums. Usually defined by a thick pile (up to 160 knots per square inch), rich colours and unique designs – Oriental rugs are made using silk, wool or cotton. They can also be flat woven. The rugs are woven by hand on a loom, with pile made of natural fibres – usually sheep’s wool – and a warp and weft foundation. The wool can vary depending on the breed of sheep, climate conditions and sheering processes; providing a variation of characteristics and quality. Wool is sometimes obtained from goats and camels, with goat hair mainly used for fastening borders. 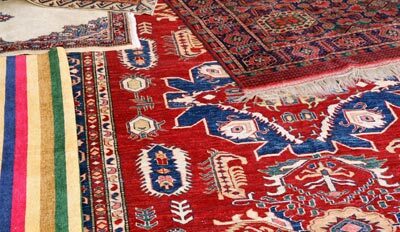 Rugs from the Far East have been known to use yak and horse hair. Silk is used in representative carpets and often metal threads (gold and silver) are also woven in. The pile consists of hand or machine-spun yarn that is knotted into the foundation of warps and wefts. The pile threads are usually dyed – with natural (plant materials or insects) or synthetic dyes. Natural dyes tend to fade gently with time and are considered superior. To complete the process, the borders are fastened, the pile is clipped to create an even surface and the carpet is washed – sometimes using chemicals to modify the colours. Uses can range from pillows and floor coverings, to room-sized carpets. Religious uses are Islamic prayer rugs (Sajjadah), Jewish Torah ark covers (Parochet) and Christian altar covers. 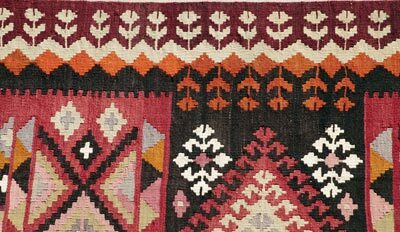 The use of pattern, colour and weave are uniquely linked with the place in which they were made or the tribe who made them. A family of weavers would record their history in the rug. The use of animals in the design have a variety of meanings – ram horns represent male fertility and a tarantula prevents bad luck. Plants also appear frequently – the Cyprus tree means immortality and the Iris, liberty. Red suggest happiness or joy, while white means purity, peace or grief. Prayer rugs tend to have a pattern that flows in a single direction. Many people can be confused with what is an Oriental Rug and what is a Persian Rug, in simple terms not all Oriental Rugs are considered Persian Rugs, but all Persian rugs are considered Oriental Rugs. To read part two of this article on oriental rugs. Book Our Rug Cleaning Service Today! Want to make an enquiry? Get in touch with us via our Online Form. Alternatively view the Other Services we offer. Copyright 2019. Simply Rug Cleaners. All Rights Reserved.